For other accident flights numbered 191, see Flight 191. Flight 191 just after takeoff and before hitting the ground, with its left engine missing and leaking hydraulic fluid. American Airlines Flight 191 was a regularly scheduled passenger flight operated by American Airlines from O'Hare International Airport in Chicago, Illinois to Los Angeles International Airport in Los Angeles, California. On May 25, 1979, the McDonnell Douglas DC-10-10 operating this flight was taking off from runway 32R when it crashed into the ground. All 258 passengers and 13 crew on board were killed, along with two people on the ground. With 273 fatalities it is the deadliest aviation accident to have occurred in the United States. The National Transportation Safety Board (NTSB) found that as the aircraft was beginning its takeoff rotation, engine number one (the left engine) separated from the left wing, flipping over the top of the wing and landing on the runway. As the engine separated from the aircraft, it severed hydraulic fluid lines that locked the wing's leading-edge slats in place and damaged a three-foot section of the left wing's leading edge. Aerodynamic forces acting on the wing resulted in an uncommanded retraction of the outboard slats. As the aircraft began to climb, the damaged left wing, with no engine, produced far less lift (stalled) than the right wing, with its slats still deployed and its engine providing full takeoff thrust. The disrupted and unbalanced aerodynamics of the aircraft caused it to roll abruptly to the left until it was partially inverted, reaching a bank angle of 112 degrees, before crashing in an open field by a trailer park near the end of the runway. The engine separation was attributed to damage to the pylon structure holding the engine to the wing, caused by improper maintenance procedures used at American Airlines. On the accident flight, just as the aircraft reached takeoff speed, the No.1 Engine and its pylon assembly separated from the left wing, ripping away a 3-foot (0.91 m) section of the leading edge with it. The combined unit flipped over the top of the wing and landed on the runway. :2 Robert Graham, supervisor of maintenance for American Airlines, stated, "As the aircraft got closer, I noticed what appeared to be vapor or smoke of some type coming from the leading edge of the wing and the No. 1 engine pylon. I noticed that the No. 1 engine was bouncing up and down quite a bit and just about the time the aircraft got opposite my position and started rotation, the engine came off, went up over the top of the wing, and rolled back down onto the runway... Before going over the wing, the engine went forward and up just as if it had lift and was actually climbing. It didn't strike the top of the wing on its way, rather it followed the clear path of the airflow of the wing, up and over the top of it, then down below the tail. The aircraft continued a fairly normal climb until it started a turn to the left. And at that point, I thought he was going to come back to the airport." The aircraft climbed to about 325 feet (99 m) above ground level while spewing a white mist trail of fuel and hydraulic fluid from the left wing. The first officer had followed the flight director and raised the nose to 14 degrees, which reduced the airspeed from 165 knots (190 mph; 306 km/h) to the takeoff safety airspeed (V2) of 153 knots (176 mph; 283 km/h), the speed at which the aircraft could safely climb after sustaining an engine failure. :53-54 However, the engine separation had severed the hydraulic fluid lines that controlled the leading edge slats on the left wing and locked them in place, causing the outboard slats (immediately left of the No. 1 engine) to retract under air load. The retraction of the slats raised the stall speed of the left wing to approximately 159 knots (183 mph; 294 km/h), 6 knots (6.9 mph; 11 km/h) higher than the prescribed takeoff safety airspeed (V2) of 153 knots (176 mph; 283 km/h). As a result, the left wing entered a full aerodynamic stall. With the left wing stalled, the aircraft began banking to the left, rolling over onto its side until it was partially inverted at a 112-degree bank angle (as seen in the Laughlin photograph) with its right wing over its left wing. As the cockpit had been equipped with a closed-circuit television camera positioned behind the captain's shoulder and connected to view screens in the passenger cabin, it is possible that the passengers were able to witness these events from the viewpoint of the cockpit as the aircraft dove towards the ground. Whether the camera's view was interrupted by the power loss from the number one electrical bus is not known. The aircraft eventually slammed into a field approximately 4,600 feet (1,400 m) from the end of the runway. :2 Large sections of aircraft debris were hurled by the force of the impact into an adjacent trailer park, destroying five trailers and several cars. The DC-10 had also crashed into an old aircraft hangar located at the edge of the airport at the former site of Ravenswood Airport, which was used for storage. 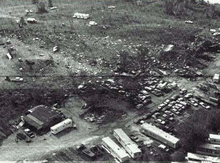 The disaster and investigation received widespread media coverage. The impact on the public was increased by the dramatic effect of an amateur photo taken of the aircraft rolling that was published on the front page of the Chicago Tribune on the Sunday two days after the crash. There were some early reports that a collision with a small aircraft had been the cause of the crash. This apparently was the result of the discovery of small-aircraft parts among the wreckage at the crash site. National Transportation Safety Board vice-chairman Elwood T. Driver, in a press briefing, was photographed holding a broken bolt and nut, implying that these parts were a cause of the accident. The small-plane parts were subsequently determined to have been on the ground at the time of the crash, at the former general aviation Ravenswood Airport, a facility that had been out of service for a few years. An owner there had been selling used aircraft parts from a remaining hangar building. Witnesses to the crash were in universal agreement that the aircraft had not struck any foreign objects on the runway. Also, no pieces of the wing or other aircraft components were found along with the separated engine, other than its supporting pylon, leading investigators to conclude that nothing else had broken free from the airframe and struck the engine. Hence, the engine/pylon assembly separation could only have resulted from a structural failure. The NTSB determined that the damage to the left wing engine pylon had occurred during an earlier engine change at the American Airlines aircraft maintenance facility in Tulsa, Oklahoma, between March 29 and 30, 1979.:68 On those dates, the aircraft had undergone routine service, during which the engine and pylon had been removed from the wing for inspection and maintenance. The removal procedure recommended by McDonnell-Douglas called for the engine to be detached from the pylon before detaching the pylon itself from the wing. 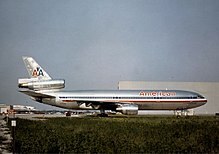 However, American Airlines, as well as Continental Airlines and United Airlines, had developed a different procedure that saved approximately 200 man-hours per aircraft and "more importantly from a safety standpoint, it would reduce the number of disconnects (of systems such as hydraulic and fuel lines, electrical cables, and wiring) from 79 to 27. ":26 This new procedure involved the removal of the engine and pylon assembly as a single unit, rather than as individual components. United Airlines' implementation involved the use of an overhead crane to support the engine/pylon assembly during removal and installation. The method chosen by American and Continental's procedures supported the engine/pylon assembly with the hold of a large forklift. The NTSB determined that the loss of one engine and the asymmetrical drag caused by damage to the wing's leading edge should not have been enough to cause the pilots to lose control of their aircraft; the aircraft should have been capable of returning to the airport using its remaining two engines. :54 The NTSB thus examined the effects that the engine's separation would have on the aircraft's flight control, hydraulic, electrical, and instrumentation systems. Unlike other aircraft designs, the DC-10 did not include a separate mechanism to lock the extended leading-edge slats in place, relying instead solely on the hydraulic pressure within the system. :53,57 The NTSB determined that the engine tore through multiple hydraulic lines as it separated from the DC-10's wing, causing a loss of hydraulic pressure; airflow over the wings forced the left wing slats to retract, which caused a stall over the left wing. :53 In response to the accident, slat relief valves were mandated to prevent slat retraction in case of hydraulic line damage. Wind tunnel and flight simulator tests were conducted to help to understand the trajectory of the aircraft after the engine detached and the left wing slats retracted. Those tests established that the damage to the wing's leading edge and retraction of the slats increased the stall speed of the left wing from 124 knots (143 mph) to 159 knots (183 mph). :23 The DC-10 incorporates two warning devices that might have alerted the pilots to the impending stall: the slat disagreement warning light, which should have illuminated after the uncommanded retraction of the slats, and the stick shaker on the captain's control column, which activates close to the stall speed. Both of these warning devices were powered by an electric generator driven by the number one engine. Both systems became inoperative after the loss of that engine. :54,55,67 The first officer's control column was not equipped with a stick shaker; the device was offered by McDonnell Douglas as an option for the first officer, but American Airlines chose not to have it installed on its DC-10 fleet. Stick shakers for both pilots became mandatory in response to this accident. The crash of Flight 191 brought strong criticism from the media regarding the DC-10's safety and design. The DC-10 had been involved in two accidents related to the design of its cargo doors, American Airlines Flight 96 (1972) and Turkish Airlines Flight 981 (1974). The separation of engine one from its mount, the widespread publication of the dramatic images of the airplane missing its engine seconds before the crash, and a second photo of the fireball resulting from the impact, raised widespread concerns about the safety of the DC-10. The final blow to the airplane's reputation was dealt two weeks after the crash, when the aircraft was grounded by the FAA. Although the aircraft itself was later exonerated, the damage in the public's eye was already done. The investigation also revealed other DC-10s with damage caused by the same faulty maintenance procedure. The faulty procedure was banned, and the aircraft type went on to have a long career as a passenger and cargo aircraft. In response to this accident, American Airlines was fined $500,000 by the U.S. government for improper maintenance procedures. On June 6, 1979, two weeks after the crash, the Federal Aviation Administration suspended the type certificate for the DC-10, thereby grounding all DC-10s under its jurisdiction. It also enacted a special air regulation banning the DC-10 from U.S. airspace, which prevented foreign DC-10s not under the jurisdiction of the FAA from flying within the country. :47 This was done while the FAA investigated whether or not the airplane's engine mounting and pylon design met relevant requirements. Once the FAA was satisfied that maintenance issues were primarily at fault and not the actual design of the aircraft, the type certificate was restored on July 13 and the special air regulation repealed. However, the type certificate was amended, stating that "...removal of the engine and pylon as a unit will immediately render the aircraft un-airworthy." Another DC-10, performing Western Airlines Flight 2605, crashed in Mexico City after a red-eye flight from Los Angeles barely 5 months after the crash of American Airlines Flight 191. The Western Airlines DC-10's crash, however, was due to low visibility and an attempt to land on a closed runway through, reportedly, confusion of its crew. Ironically, the crash of yet another DC-10, United Airlines Flight 232, ten years later, restored some of the aircraft's reputation. Despite losing an engine, all flight controls, crash-landing in a huge fireball (which was caught on video by a local news crew), and killing 111 people, 185 people survived the accident. Experts praised the DC-10's sturdy construction as partly responsible for the high number of survivors. The crash of yet another DC-10 at the end of November, Air New Zealand Flight 901, exactly six months after Flight 191, added to the DC-10's negative reputation. The crash of Flight 901, an Antarctic sightseeing flight which hit a mountain, was caused by several human and environmental factors not related to the airworthiness of the DC-10, and the aircraft was later completely exonerated in that accident. Firefighters survey the Flight 191 crash site in Des Plaines, Illinois. Despite initial safety concerns, DC-10 aircraft continued to serve with passenger airlines for over 30 years after the crash of Flight 191. DC-10 production ended in 1988. Many retired passenger DC-10s have since been converted to all-cargo use. DC-10 freighters, along with its derivative, the MD-11, constitute part of the FedEx Express fleet. The DC-10s have been upgraded with the glass cockpit from the MD-11, thereby turning them into MD-10s. American Airlines retired its last DC-10s in 2000 after 29 years of service. In February 2014, Biman Bangladesh Airlines operated the final DC-10 passenger flights. DC-10s continue to be used extensively in air freight operations, and military variants also remain in service. Captain Walter Lux, 53, had been flying the DC-10 since its introduction eight years earlier. He had logged around 22,000 flying hours, of which about 3,000 were in a DC-10. He was also qualified to pilot 17 other aircraft, including the DC-6, the DC-7, and the Boeing 727.:75 First Officer James Dillard, 49, and Flight Engineer Alfred Udovich, 56, were also highly experienced: 9,275 hours and 15,000 hours, respectively; between them, they had 1,830 hours' flying experience in the DC-10. Itzhak Bentov, a Czechoslovakia-born Israeli–American biomedical inventor (the cardiac catheter) and New Age author (Stalking the Wild Pendulum and A Cosmic Book). Leonard Stogel, music business manager/promoter/producer/executive for California Jam, California Jam II, Sweathog, The Cowsills, Sam the Sham, Tommy James and the Shondells, Redbone, Gentle Giant, and other musical groups. Coincidentally, Stogel's parents had earlier perished on American Airlines Flight 1. For 32 years there was no permanent memorial to the victims. Funding was obtained for a memorial in 2009, through a two-year effort by the sixth-grade class of Decatur Classical School in Chicago. The memorial, a 2-foot-high (0.6 m) concave wall with interlocking bricks displaying the names of the crash victims, was formally dedicated in a ceremony on October 15, 2011. The memorial is located at Lake Park at the northwest corner of Lee and Touhy Avenues, two miles east of the crash site. The cable/satellite TV channel the National Geographic channel produced a documentary on the crash, and an episode from Seconds From Disaster titled "Chicago Plane Crash" detailed the crash and included film of the investigation press conferences. The Canadian television series Mayday profiled the crash in the episode "Catastrophe at O'Hare", which has subsequently aired in the U.S. on the Smithsonian Channel's television series Air Disasters. Chicago folk singer Steve Goodman wrote the song "Ballad of Flight 191 (They Know Everything About It)" in response to the crash and the subsequent investigation as the inaugural song for a series of topical songs which aired on National Public Radio in 1979. The Michael Crichton novel Airframe described the incident in detail as an example to the reader how a "good airplane (DC-10)" could be "destroyed by bad press". ^ a b c d e f g h i j k l m n o p q r s t u v w x "Aircraft Accident Report: American Airlines, Inc. DC-10-10, N110AA, Chicago O'Hare International Airport, Chicago, Illinois, May 25, 1979" (PDF). National Transportation Safety Board. December 21, 1979. NTSB-AAR-79-17. Retrieved September 6, 2016. ^ a b c Vatz, Mara E. (2004). Knowing When to Stop: The Investigation of Flight 191 (Masters thesis). Cambridge, MA: Massachusetts Institute of Technology, Dept. of Humanities, Program in Writing and Humanistic Studies. p. 9. OCLC 59008054. Retrieved May 2, 2015. ^ Special to the New York Times (May 27, 1979). "Dive May Have Been Televised". The New York Times (Vol. 128, No. 44, 230). NYTimes Co. Associated Press. Retrieved March 21, 2018. ^ Young, David (June 3, 1979). "'...191, do you want to come back?'". Chicago Tribune (Issue: 132nd Year, No. 154). p. 16, Section 1. Retrieved May 27, 2017. ^ Macarthur, Job (1996). Air Disaster (2 ed.). Shrewsbury: Airlife. p. 49. ISBN 9781875671199. OCLC 464170955. ^ "Accident Photo: American 191". AirDisaster.Com. Archived from the original on June 7, 2011. Retrieved April 16, 2011. ^ "Tuskegee Airman Heads Chicago Air Crash Probe". JET. 56 (13): 5. June 14, 1979. Retrieved April 16, 2011. ^ "Abandoned & Little-Known Airfields: Illinois, Northern Chicago area". Abandoned & Little-Known Airfields. Retrieved April 15, 2011. ^ a b c "Chicago DC‐10 Accident Findings". Aircraft Engineering and Aerospace Technology. 52 (3): 19–20. 1 March 1980. doi:10.1108/eb035612. ISSN 0002-2667. ^ a b c Barnett, Arnold; Lofaso, Anthony J. (November 1, 1983). "After the Crash: The Passenger Response to the DC-10 Disaster". Management Science. 29 (11): 1225–1236. doi:10.1287/mnsc.29.11.1225. ISSN 0025-1909. ^ a b c Thornton, Paul (January 7, 2007). "A final flight into the history books". LA Times. Retrieved April 15, 2011. ^ a b Mankiewicz, R.H (1981). "Statut et interprétation des dispositions de la Convention de Chicago en droit américain dans l'affaire des DC 10". Annuaire français de droit international (in French). 27 (1): 499–504. doi:10.3406/afdi.1981.2458. ^ "ASN Aircraft accident McDonnell Douglas DC-10-10 N110AA". AviationSafety.net. May 11, 2007. Retrieved July 27, 2009. ^ Ranter, Harro. "ASN Aircraft accident McDonnell Douglas DC-10-10 N903WA Mexico City-Juarez International Airport (MEX)". Retrieved February 6, 2017. ^ "Runway Confusion Tied to Jet Crash". The Pittsburgh Press. UPI. November 1, 1979. ^ "Aircraft Accident: DC. 10 ZK-NZP Flight 901". New Zealand Disasters. Christchurch City Libraries. Archived from the original on July 8, 2011. Retrieved July 13, 2011. ^ "McDonnell Douglas' DC-10 makes its last passenger flight today". The Verge. Retrieved December 6, 2013. ^ "Federal Express Fleet". Airfleets.net. Retrieved April 16, 2011. ^ "MD-10 Program". Boeing. Archived from the original on May 10, 2011. Retrieved April 16, 2011. ^ Special To The New York Times (May 27, 1979). "American Airlines' List of Passengers Killed in Jet Crash at Chicago". The New York Times. NYTimes Co. p. 20. Archived from the original on September 9, 2017. ^ "Investigation: American Airlines 191". AirDisaster.com. Archived from the original on August 13, 2006. Retrieved July 26, 2006. ^ "Family's air tragedy repeats itself". The Milwaukee Sentinel. The Associated Press. May 29, 1979. Retrieved January 16, 2016. ^ "Finally, a memorial for American Flight 191 that we've missed out for the last 3 decades. victims". Daily Herald. Retrieved August 6, 2011. ^ Delgado, Jennifer. "Memorial to victims of 1979 plane crash unveiled". Chicago Tribune. Retrieved October 15, 2011. ^ "Flight 191 Memorial - Des Plaines Park District". dpparks.org. Retrieved April 1, 2018. ^ The Crash of Flight 191 (DVD). The History Channel. Archived from the original on October 31, 2007. ^ "Chicago Plane Crash / Flight Engine Down". Seconds From Disaster. National Geographic Channel. ^ "Air Disasters". Smithsonian Channel. Archived from the original on March 5, 2016. Retrieved January 16, 2016. ^ Eals, Clay (2007). Steve Goodman: Facing the Music. Toronto: ECW. pp. 558–9. ISBN 978-1-55022-732-1. This page is based on the Wikipedia article American Airlines Flight 191; it is used under the Creative Commons Attribution-ShareAlike 3.0 Unported License (CC-BY-SA). You may redistribute it, verbatim or modified, providing that you comply with the terms of the CC-BY-SA.